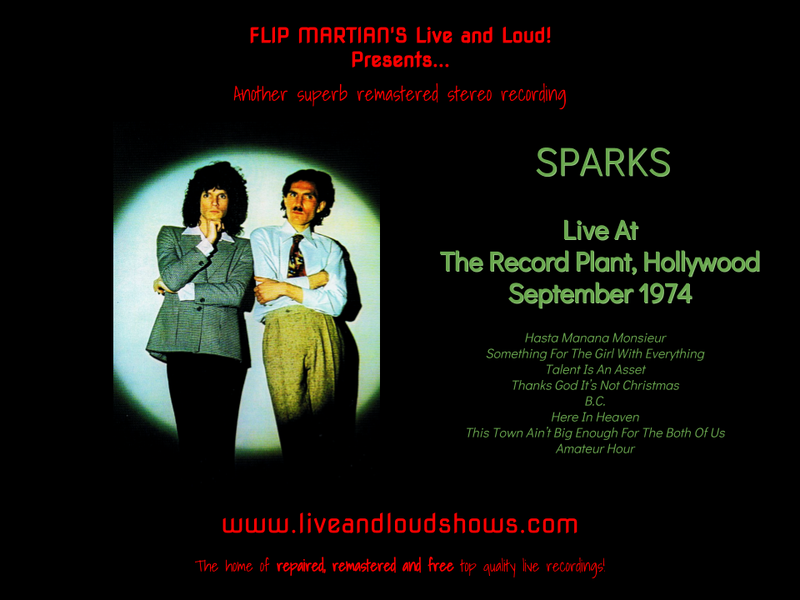 A first showing for Sparks on Live and Loud! and hopefully not the last. A great set from a publicity appearance at The Record Plant in front of a select audience - the first of two sets I think. The original recording was also available once as a bootleg entitled One and a Half-Nelson and was basically clean, if a bit thin and rather hissy. So I cleaned up the hiss - leaving a little in, to avoid that suffocating "everything sounds underwater" quality so many recordings have get when hiss has been removed badly. After that, it was out with a 30 band graphic EQ to tighten up the bass and drums and take away a bit of harshness which was noticeable on the vocals and Ron's piano, and to reshape the sound a bit to make it clearer. Fairly subtle changes which will really be heard if you listen on good 'phones or speakers. If you've never heard the original bootleg, well you're in for a treat! A short set but with plenty of chatting from Russell in between songs. All in all, its a great record of Sparks not long after they hit the bigtime in 1974. Mainly songs from Kimono My House but two tracks also from Propaganda (which was released a month or 2 later) make an appearance too.